One of our favorite things to do in New York City is of course, eat. I grew up in New Jersey not far from NYC and have loved eating there since I was a kid. When our family would go into the city around Christmas time, a special restaurant was always part of the plan. Any kind of food you can imagine is there. To me that’s one of the greatest things about New York City, and why it’s hands down one of the best food destinations in the USA. Fast forward many years and countless trips to the city for work and pleasure, and I still love the great restaurant scene here. Jewish, Italian, Korean, Chinese — you name it, it’s there, a United Nations of food. If you’re looking to try some of the best ethnic food in NYC, here are some good ones to try. We hit the jackpot with just two days in NYC this year and 4 amazing flavors (you gotta play to win! ): one favorite restaurant that did not disappoint again, one landmark restaurant I can’t believe we’ve never eaten at in all these years, a very good Thai noodle bar, and my new favorite place for soup dumplings. If you’ve followed along with us on our travels, you may have noticed that we typically write about what local foods to eat in a given place, and not necessarily where to eat. Restaurants have a way of changing hands, changing formats and menu items, or closing altogether. But this year on our annual trip to New York for Travmedia’s International Media Marketplace (IMM) conference and the New York Times Travel Show, we ate some food that was so good, we just had to share it. Check out these great places to eat on your next visit to the Big Apple. We were looking for something different late in the morning and not the usual bagel, donut, cronut, or croissant. Something warm and comforting. Something like soup dumplings! And wow, did Kung Fu Kitchen hit the spot. 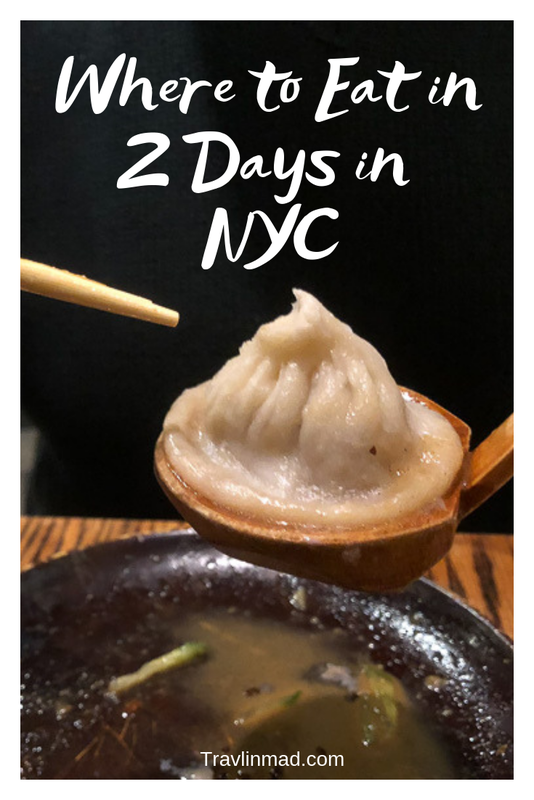 If you too have a hankering for Chinese comfort food, go here for the authentic steamed buns (xiao long bao), soup dumplings, and dim sum made as they do in the several regions in China. And the noodles here are hand pulled, made in the traditional Lanzhou style. Chef Peter Song has been so well received in New York, this Hell’s Kitchen location is the second he’s opened, after his first in Flushing, and others in Midtown. We ordered the pork and shrimp soup dumplings, pork and shrimp steamed dumplings, and the cold sesame noodles garnished with fresh cucumber and tomato. It was perfect for two and so comforting on a cold winter day in NYC. This Thai fusion restaurant on 9th Avenue is small and cozy, with traditional Thai and noodle favorites and some other favorites from Korea, Vietnam and China too. It’s popular for lunch and dinner, and super close to the Javits Center if you happen to be attending a conference there like we were. I tried the Spicy Cantonese Noodles with homemade noodles and the perfect ratio of flavor to spiciness, and Angelo was happy with one of his favorites, the Duck Noodle Soup. We first ate at Mercato in 2017, when we were too cold and tired to walk far after spending all day at the New York Times Travel Show. We were beat, and Mercato Trattoria was right around the corner from our hotel in Hell’s Kitchen. All we can say is what a find! We’d also recently returned from a trip to Italy and one look at the menu told us the Chef or Owner had to be from Italy. Many of the dishes were authentically Italian, and preparations and presentations made us feel like we were back in Naples. As it turns out, Chef Fabio Camardi opened Mercato to recreate the family style cuisine of his birthplace Taranto in southern Italy. So this year, we couldn’t wait to try it again. Starting with a good bottle of Chianti, we again ordered the housemade Eggplant Caponata appetizer and split the Rocket salad (arugula) with fresh parmigiano reggiano shavings and balsamic glaze. For entrees, I tried the Rigatoni with eggplant, and Angelo had the Linguine with Pesce de Mare. The seafood was fresh and delicious. You’d think we’d be stuffed by this time, and we were. But when we saw the waitress deliver a small plate of fried pettole (dough balls) in strawberry sauce to the table next to us, we had to try them. Our neighbors didn’t want to share — can you imagine? — so we had to order our own. ;-) One order was four small pieces, and a perfect sweet ending to a great meal! I’m almost embarrassed to admit I’d never been to Katz’s before, because when it was made famous by When Harry Met Sally (and Meg Ryan in particular if you remember the famous “I’ll have what she’s having” scene), the place went from authentic Jewish deli to iconic tourist trap, packed to the gills day and night. Since 1888, Katz’s has been a New York City institution and if you pick your time well, you can avoid the massive lines and crowds. This year, after a late night party downtown, we hoped a cab to head uptown and find a place to eat at 10:30pm. Three seconds into our cab ride when we saw Katz’s was nearly empty, we abandoned the cab and went in for our first experience. We were already prepared for the mile-high sandwiches with the hefty price tags. The question was, were they worth the price. We decided to split the $21.95 Pastrami sandwich (plenty for two people), which came with a plate of homemade pickles and pickled cucumbers — yes, they’re two different things. Next down the line we ordered a side of homemade cole slaw and a pint of lager. One of the fun interior features at Katz’s are the hundreds of celebrity photos adorning the walls. We randomly sat down at our booth not paying attention to who was on our wall, and laughed out loud when we saw Estelle Costanza from Seinfeld smiling down at us. Georgie, I’m huuuungry! So, how was our first sandwich at Katz’s? Put it this way… I’d have what she was having again and again! Food tours are a great way to discover a place because food is such an expression of culture. This is especially true of New York City, where the term local food takes on a whole new meaning when you visit this cultural melting pot. NYC — and the whole country, when you come down to it — is a city of immigrants, and the food is a fusion of flavors brought from other places, that continues to evolve as new cultures tweak the recipe. So local food in NYC is largely the original stuff brought here from Africa, Europe, Asia, Scandinavia, South America, pretty much everywhere else around the world. So whether you’re looking for the best pizza in NYC, your grandmother’s knish, traditional hot pot or ramen, or authentic pickled herring — you’re sure to find it in New York City. Our grandparents were among those that came to America at the turn of the 20th century (around 1906) when so many Italians arrived. If you love learning about the early waves of immigration to the United States and the foods they brought with them and helped established in Manhattan, we highly recommend taking the Tenements, Tales, and Tastes food and history tour with Urban Adventures — one of the most interesting history lessons and tasting tours we’ve taken.